For use with Caravan Displayshade, Aluma, or Classic series frames. Dimensions: 5 ft. x 5 ft. Custom Colors Available in Gold, Black, Navy Blue, Turquoise, Orange, Grey, Yellow, Purple, Pink, Brown, Burgundy, Green, Forest Green, or Camouflage. Please allow an additional 2-3 business days for custom orders. 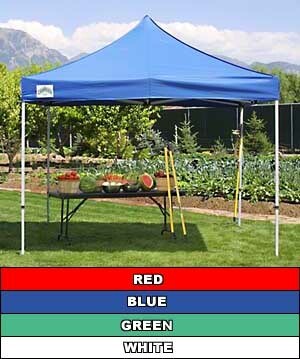 Is your old canopy worn out, faded, or you just don't like the color? Try one of these 5 x 5 replacement tops from Caravan Canopy. They come in four standard colors (red, green, blue, white) as well as 14 other custom colors you can choose from. These Caravan Canopy replacement tops are fire and water resistant and assembly is simple! Just place the top over the 5x5 frame you already own! * Please Note: The item being sold on this page is the Canopy Top ONLY - it does not include the canopy frame.